All right. What can we glean from the above? Most things go up (lipstick, wine, food), but a few things go down (technology tends to get cheaper: think how flat screen T.V.s in 2016 are a fraction of what they were in 2006). And some things stay the same (for awhile anyway). And with that, I think we have enough information to answer our question: Imagine that the interest rate on your savings account was 1% per year and inflation was 2% per year. After one year, how much would you be able to buy with the money in this account? Let’s go back to our $100. If inflation is 2%, a basket of goods that cost $100 today, will cost $102 next year. I don’t know about you, but I’m losing the kale! Like what you just read here? Subscribe and never miss a single post (it's free). 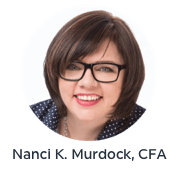 Previous Post: « Ask Nanci: Should I Wait Until I’m Rich?